Abstract: Objective To quantitatively analyze the difference in retinal thickness of the macular outer nuclear layer (ONL) between high myopia patients and normal subjects using spectral-domain optical coherence tomography (SD-OCT).Methods Seventy-eight participants (78 eyes) were divided into normal control group and high myopia group, according to the spherical equivalent (SE) of each eye. There were 24 cases (24 eyes) in the normal control group (-0.25 D~+0.25 D) and 54 cases (54 eyes) in the high myopia group (SE < -6.00 D). 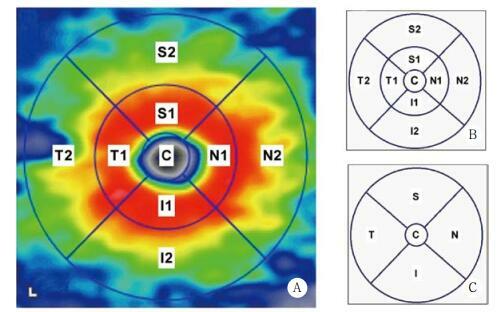 The macular retina was scanned using the posterior pole asymmetry analysis mode of the Heidelberg Spectralis (SD-OCT) system and divided into 9 areas according to Early Treatment of Diabetic Retinopathy Study. Quantitative analysis was performed to compare the difference in retinal thickness of the macular ONL in each area between the high myopia and normal control groups.Results The ONL thickness in the central area of the macular retina was significantly higher than that in the superior, nasal, inferior, and temporal areas (P < 0.001 for all comparisons). 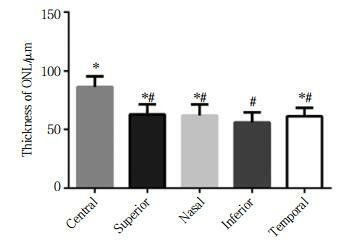 The ONL thickness in the inferior area of the macular retina was significantly lower than that in the central, superior, nasal, and temporal areas (P < 0.001 for all comparisons). In other sub-regions, no difference in the ONL thickness was found. The ONL thickness in the central, superior, nasal, inferior, and temporal areas was significantly lower in the high myopia group than in the normal control group (P < 0.05 for all comparisons).Conclusion Regional variation is observed in the ONL thickness. The ONL thickness in the macular area of patients with high myopia is thinner.